Forestry Corporation is currently harvesting and replanting the timber plantations within Tarkeeth State Forest, near Bellingen. We will be harvesting and replanting the plantations in this forest over the coming years. Tarkeeth State Forest near Bellingen is 1450 hectares in size and around 60 per cent of this area is timber plantation. The entire Tarkeeth State Forest is former farmland. Most of the area was historically cleared and used for agriculture before 850 hectares were planted with a timber crop in the 1960s and 1970s. Other formerly cleared areas were allowed to regenerate naturally into native regrowth forest. Currently, Forestry Corporation is only working in the timber plantations within Tarkeeth State Forest. The Forestry Commission purchased the entire area in 1984. 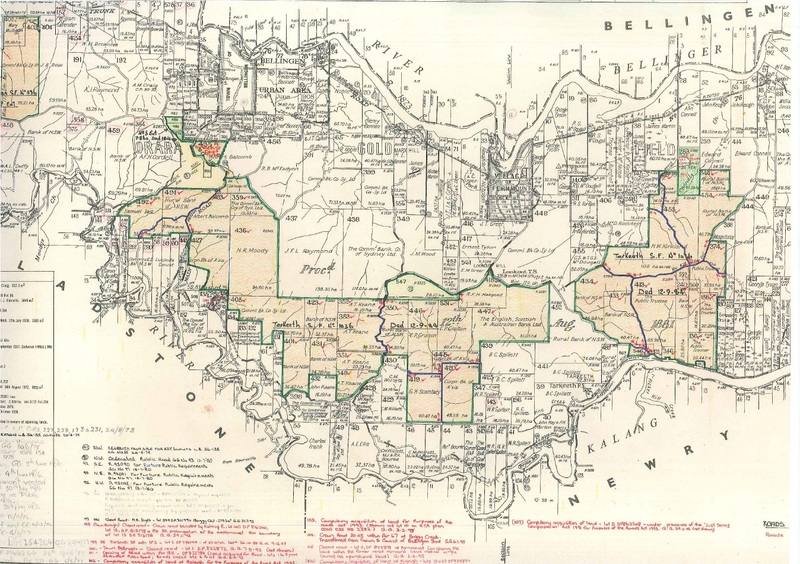 As the map below from the Forestry Commission records at that time shows, most of the land was privately owned farms. Forestry Corporation is harvesting timber from mature plantations in Tarkeeth State Forest. We are completing this work a section at a time over several years and replanting as we go – in fact, we have already started by harvesting and replanting around 100 hectares in 2012. Harvesting will involve a number of separate operations that will be spaced out over several years. Each of these operations will be around 100 to 150 hectares in size. Burning remaining branches and crowns from last year’s harvest to create a rich seed bed for replanting. This should be completed within a couple of days and will be scheduled when the weather conditions are appropriate. Weed control operations using ground-based machinery. This is expected to take two weeks and will commence when the weather conditions are appropriate. Hand planting more than 1,000 blackbutt and tallowwood seedlings per hectare over the area harvested last year. This will take around one week and create a multi-species plantation. While both species produce high quality timber, young tallowwood leaves are also a preferred koala food. Recommencing harvesting operations in other sections of the timber plantations. These operations are expected to continue until late 2018. These operations are wholly within the State forest plantations and have been carefully planned in line with strict environmental regulations to ensure waterways, native forest and special environmental features are protected during operations. Planning Foresters have spent many months completing a range of environmental and logistical assessments, carrying out environmental and Aboriginal cultural heritage surveys throughout the area and consulting local neighbours while developing plans to harvest the rest of the plantations within the forest. Plantations are planned under the Plantation and Reforestation Code, which contains strict requirements to protect numerous environmental features. 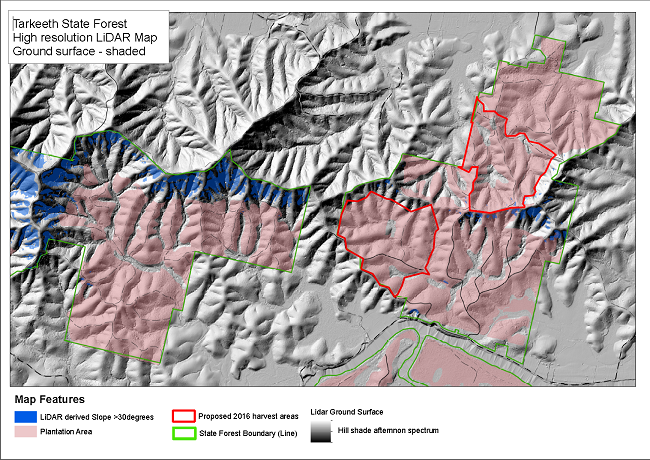 Plans detailing how each section of forest will be harvested in line with the Code will be published in the harvest plan section of our website as they are finalised. There will be work sites established in Tarkeeth State Forest throughout plantation harvesting and replanting operations. Timber harvesting is a dangerous activity and areas will be closed while operations take place. Information about closures will be updated on the closures and notices section of this website. For your own safety please pay attention to all signs and instructions from staff in the forest and don’t enter restricted areas. Following community feedback, Forestry Corporation has adopted the Environment Protection Authority’s Interim Construction Noise Guidelines for its operations. In line with these guidelines, harvest and haulage activities will only take place between 7 am and 6 pm weekdays and between 8 am and 1 pm on Saturdays. We understand there may be some inconvenience during forest operations and we thank neighbours for their cooperation and understanding during this work. The Tarkeeth State Forest plantations are situated within a broader forested landscape, which includes National Parks and native State Forests managed for conservation, recreation and timber production. While the trees in the Tarkeeth plantations were specifically planted for future timber production, our staff work in the bush every day and are passionate about conserving wildlife which is why we carefully plan all our work before we touch a single tree. Harvesting in timber plantations is planned under the Plantation and Reforestation Code, which contains numerous requirements to protect environmental features. In addition, Forestry Corporation has identified a number of other protection measures, including a connectivity corridor running east to west through the plantation to complement the vast area of National Park in the Bellingen Valley and allow wildlife to continue moving freely across the landscape. Forestry Corporation employs a team of Aboriginal Partnerships Liaison officers who liaise with local Aboriginal groups to identify, preserve and manage areas of cultural significance and contribute to Aboriginal cultural heritage surveys. An Aboriginal Cultural Heritage Officer from Forestry Corporation has surveyed the site to ensure any cultural heritage items are identified and protected and the Coffs Harbour and District Local Aboriginal Land Council has endorsed the survey. All timber harvesting is tightly regulated by strict legislation and our operations are independently audited. Forestry Corporation has been harvesting timber from plantations in the Bellingen and Kalang Valleys for many decades and understands the importance of these waterways to local communities and the broader environment. Forestry Corporation has carefully planned its timber harvesting in the Tarkeeth plantations under the conditions of the Plantations and Reafforestation Act and Code, which set out clear constraints including the retention of existing vegetation along drainage lines and on steep slopes to protect against erosion and buffer zones around dams and waterways. We have used sophisticated LiDAR imagery and data to map all of the slopes within the plantation so we know exactly where the steep areas are, as the image below shows. The harvesting machinery operators use GPS systems in the forest to ensure that harvesting avoids any areas that we require to be protected. The strict limits we have put in place on harvesting timber on steep slopes in this plantation go above and beyond the requirements of the Plantations and Reafforestation Act and Code. We will be harvesting the plantations in sections around 100 hectares in size and replanting each area with more than 1,000 trees per hectare soon after we complete harvesting. A thorough assessment of potential erosion hazards will be completed in each part of the plantation to ensure cultivation practices are specifically designed to suit the area. Eucalyptus plantations are managed very differently to native forests because they have been specifically planted to grow timber as quickly as possible. Timber plantations are essentially a long term agricultural crop, needing roughly 35 years to mature between planting and final harvest. In NSW, timber crops are grown on previously cleared land in an ongoing cycle, with new seedlings replanted on the same site once the mature trees have been harvested. Eucalyptus are light-loving, so a new crop of seedlings will grow most vigorously when the whole of the previous crop has been harvested, as that provides adequate light and space for new seedlings to thrive. About halfway through the plantation cycle, we also go in and remove smaller and weaker trees to allow the remaining trees more space and light to grow. This process is known as thinning. Forestry Corporation’s plantation management is based on science and carried out in line with the Plantations and Reafforestation Act and Code, which is the NSW legislation on plantation management. By managing timber plantations as productively as possible, we will reduce the amount of timber sourced from native forests. Timber plantations make an important contribution to the supply of sustainable wood and wood products in NSW. Timber is a renewable resource that’s in demand throughout Australia and the world and sourcing timber from plantations and then restocking those plantations for the future is a really sustainable way to ensure we continue meeting the community’s timber needs. NSW has the largest number of hardwood sawmills in Australia and the timber and wood products industries directly employ more than 500 men and women in the Coffs Harbour, Nambucca and Bellingen areas alone according to ABARES. The timber from the Tarkeeth State Forest plantations will be supplied to several sawmills in the Bellingen Valley, Nambucca and Grafton who will process them into a range of timber products that may include power poles, timber flooring and decking, pallets, fencing, roof battens and plywood. The full range of timber products from power poles to timber pallets for transporting goods provide an important source of local work and revenue to businesses in the Bellingen area. 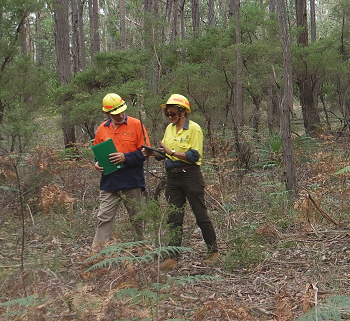 Forestry Corporation staff and contractors also live and work locally in regional centres across the NSW north coast. Following harvesting the site will be cultivated and replanted with local native species, Blackbutt and Tallowwood. More than 1000 trees will be planted on every hectare that is harvested to re-establish a high quality timber plantation for the future. This will ensure future generations can continue to source high quality and sustainable timber products from Tarkeeth State Forest. After timber plantations are harvested, there is always some residue left on the forest floor including branches, leaves and smaller parts of trees that can't be processed into timber products. Burning this residue ensures it doesn't build up and become a fire hazard and, importantly, also creates a rich seed bed where the newly planted seedlings can flourish. We will be harvesting the Tarkeeth plantations a section at a time and burning will only take a few days after each operation is complete in each harvested area. The Tarkeeth plantations are a wonderful demonstration of how forests can be regrown on previously cleared agricultural land and after we harvest these mature plantations we will re-establish new plantations to supply sustainable local timber for future generations. Forestry Corporation has developed a seed orchard within Tarkeeth State Forest to develop a seed store for high quality local native species that will be cultivated in our production nurseries and planted to re-establish the Tarkeeth plantations. Forestry Corporation manages plantations over a 30 to 40 year cycle, from planting through to final harvest and replanting. As each section of plantation is harvested, it will be quickly replanted with more than 1000 native seedlings per hectare. Replanting will include some weed control operations, involving spraying of common agricultural use chemicals, such as round-up. We do need to complete weed control two or occasionally three times at the beginning of a timber plantation's 30-40 year life cycle to knock down the pest plants like lantana and privet and get new tree seedlings established quickly so that they out-compete weeds. The most effective way to do this is by spraying the area before the new seedlings are planted. The herbicides used and the number of applications will depend on the weeds present following site preparation, with our aim being to minimise chemical use. Spraying methods will be site dependent and a combination of methods, including back pack, skidder and drone will be used. All these methods will be controlled from the ground and applied just above the weed layer. During May 2017, Forestry Corporation will treat around 50 hectares of recently harvested plantation to remove weeds including grasses, tobacco bush, lantana, camphor laurel, bracken fern and other woody weeds ahead of replanting 1,100 eucalyptus seedlings in every hectare. To tackle these weeds, Forestry Corporation will be applying a diluted mix that contains 270 millilitres of Weedmaster ARGO, three grams of Associate, 600 millilitres of Starane Advanced and 200 millilitres of Pulse per 100 litres. These herbicides have all been bought off the shelf and will be used in line with the label directions, which the Australian Government regulators have approved as safe for the community and the environment. Strict buffers will be in place to prevent spraying near any waterways or streams. Forestry Corporation has been successfully managing timber harvesting alongside forest-based tourism in local State forests for many years. In fact, Forestry Corporation has already won a number of awards for developing and promoting tourism in the State forests of the Coffs Coast. Millions of visitors flock to State forests every year for the adventure tourism opportunities they offer, from camping to trail bike riding, to four wheel driving and rock climbing. 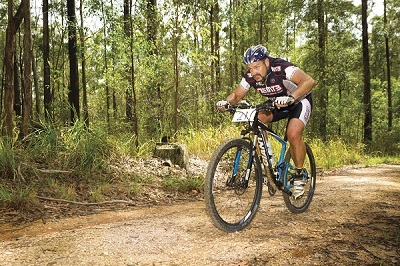 Forestry Corporation invests in developing recreational roads, walking and bike trails in local forests and plantations and a significant proportion of the World Rally Championships, which bring millions of tourism dollars to the region annually, is held on local State Forest roads, with the Wedding Bells State Forest plantation one of the more popular spectator spots. Forestry Corporation also has arrangements with hundreds of groups ranging from mountain biking clubs to archery clubs who have facilities and events on State forests. All of these activities are managed in tandem with the harvesting operations that supply the north coast’s significant sustainable timber industry. The Bellingen Shire boasts a range of plantations and native forests managed by Forestry Corporation. Areas we plan to harvest in 2017-18, weather and markets permitting. Detailed harvest plans will be prepared for each operation before any work commences.